There have been probably dozens of photo finishes in the history of the 52 Super Series but today’s decider between Quantum Racing and long time rivals Azzurra was undoubtedly one of the most exciting ever. That, at 200 metres from the line, there was nothing at all between the American flagged champions and the home club’s own emblematic team meant it was going to be close, but both TP52’s – scrapping over the top of the table spot – were charging to the line at full throttle in 25 knots of wind. 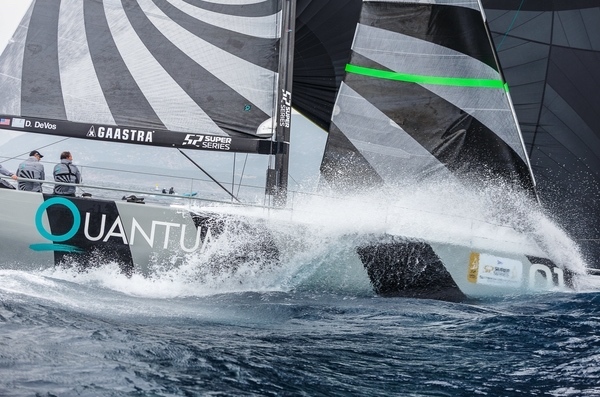 It was Quantum Racing, the holders of the Settimana delle Bocche regatta title, which just pipped Azzurra, giving the first ever 52 Super Series winning gun for the new, 2015 build Quantum Racing coming after 17 races. 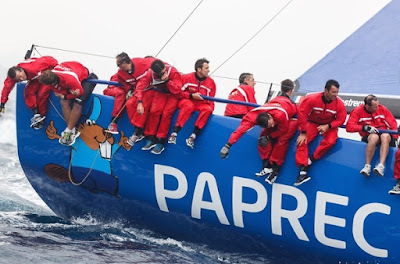 That they had made a big recovery, from fifth at the first windward mark, to taking the lead at the top of the second beat after they read a big shift in the wind to the left and steal ahead of leaders Azzurra, was especially tough for the home team to believe, especially after they sailed impeccably and had not really put a foot wrong. 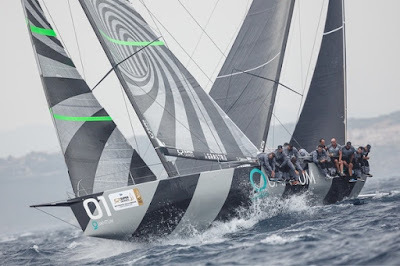 At the time that Quantum Racing went left Azzurra had their hands full protecting their lead, but Italian tactician Vasco Vascotto paid tribute to his opposite number on Quantum Racing, Terry Hutchinson, for recognising the opportunity and taking it with both hands. “I am very proud of what we did as a team. We deserved to win this race. You cannot control everything. They tried and had a chance and as usual Terry did a great job. If I had to pick a boat today I am proud of what my guys did. We did a nice job, controlled the boat, controlled the manoeuvres. To be in control in these conditions is not easy and if we have the same conditions tomorrow I hope we will sail the same way,” Vascotto said. 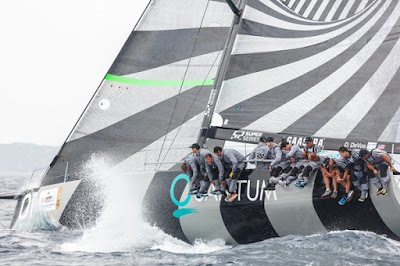 Victory for Quantum Racing to Azzurra’s second, with erstwhile regatta leaders Bronenosec finishing fourth today leaves Doug DeVos’ team two points clear in the overall lead of Azzurra with the Russian team now three points further back. 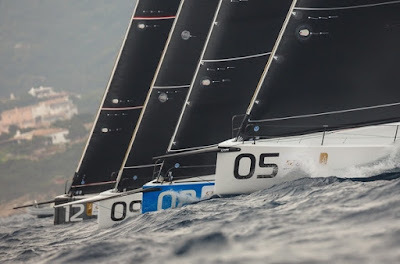 Ergin Imre’s Provezza IX, with British Olympian Andy Beadsworth steering, took third today to move up to fourth overall. 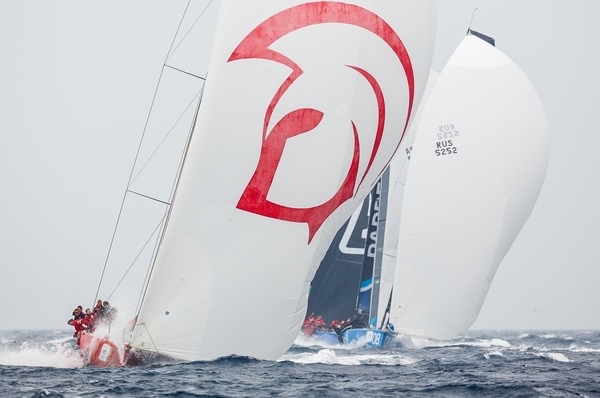 With over 35 knots of wind on the race area during the morning and early afternoon the fleet were held ashore until after 1500hrs this afternoon. The sou’easterly breeze was a manageable 18-20 knots at the start but came in at over 25 knots in the gusts on the second round. 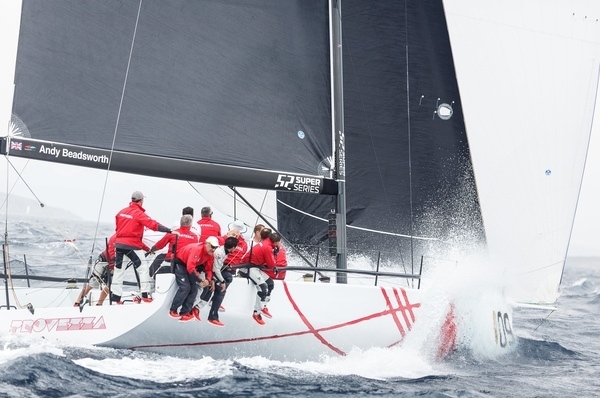 Clean, sharp boat handling, especially on the corners and manoeuvres, was vital in conditions in which most of the teams had not yet raced their new boats. 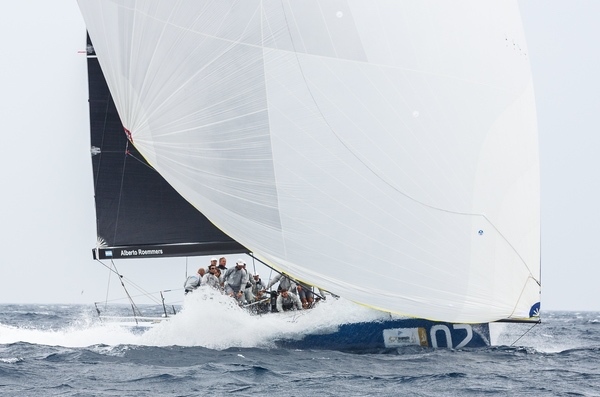 Gladiator lead from the left side at the top mark first time up ahead of Azzurra and Paprec with Quantum Racing in fifth after losing out on the second half of the beat. Down the first fast and furious run Gladiator held on while Quantum Racing managed to pass Paprec. 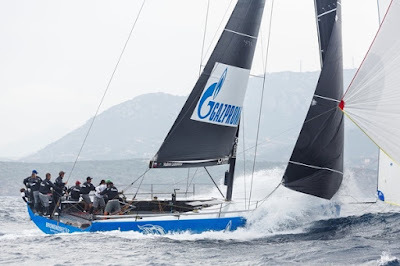 But while Azzurra sought to control Bronenosec and, initially Gladiator, Quantum Racing and Provezza profited from the significant shift to the left out of the left side of the course. 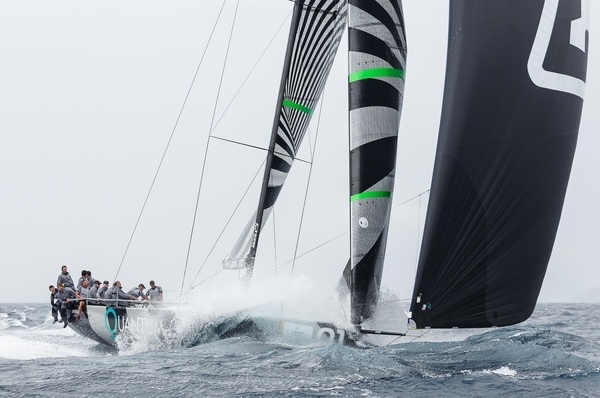 Round the top mark for the final time Quantum Racing stole the lead from Azzurra to set up an adrenalin filled, edge of control head to head down the run, all the way to the line. Surfing at 22-23kts the pair separated and Azzurra looked to have made enough of a gain, but it was down to the final dip for the line, Doug DeVos’ team edging out the Roemmers family’s crew by mere seconds. “It was incredible, it was close, it was nailbiting. 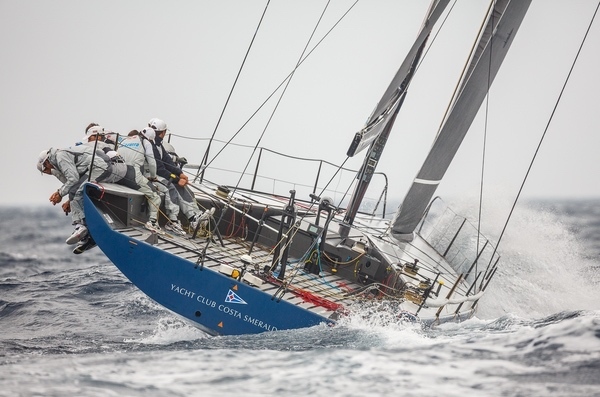 The speed of the boats downwind was incredible. The power of the boats upwind was incredible. And still closeness of the fleet is still amazing. 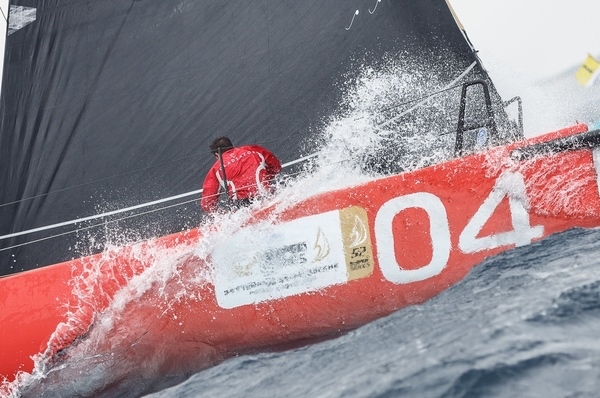 We finished metres apart from Azzurra," de Vos said. "Every time Terry was telling me I had to drive better I wanted to just say: 'But Terry I have not done this in 18 months...' But I didn’t. But it is tough. 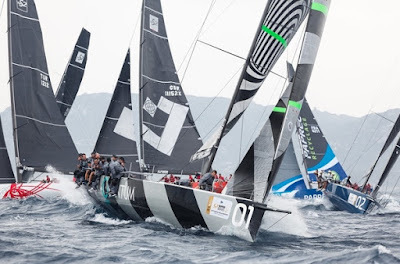 You start the series in nice winds and flat water and then today with big waves, to try to get a feel for the boat, it is a new boat, it was really difficult," he added. "We just want to keep hanging in with the competition and see where things end up. And, so, luckily that is what we got today. We had not won a race today this season, and so to get a win today was just huge." With just two points separating Quantum Racing ahead of Azzurra a thrilling finale is assured Saturday when the breezes are again expected to be 20 knots and above.